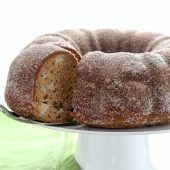 Your favorite apple cider donut, reinvented into a moist spiced cake, coated in sweet cinnamon and sugar! A fun Fall treat, perfect for brunch or dessert! In a large measuring cup, whisk together apple cider, eggs and vanilla. In a large bowl or stand mixer combine remaining dry ingredients. With mixer running on low, slowly add liquid ingredients. Mix until just combined and no streaks remain. Mix in apple chunks by hand. Pour batter into prepared pan. Bake for 35-40 minutes or until a toothpick inserted comes out clean. Cool in pan, set on a wire rack, until easy to handle. In a small bowl, combine granulated sugar and cinnamon. Set aside. In a medium bowl, beat together whipped cream ingredients until nearly stiff peaks form. Keep chilled until ready to use. Place a wire rack over a rimmed baking sheet. Invert cake onto wire rack. Sprinkle cinnamon-sugar mixture over the top of the cooled cake. Tilt cake as needed to coat all sides. Reuse cinnamon-sugar mixture from baking pan, sprinkling over cake until entire cake is coated well. *If cinnamon-sugar mixture does not stick, lightly brush melted butter on the cake and repeat sprinkling of cinnamon-sugar. Slice and serve with optional whipped cream. *Baking spray includes flour. Do not use olive oil spray or traditional cooking spray. Alternately you may butter and flour the pan well.